Malanie McLellan, foster daughter of Karen Ertell, held son, Jack, 7 months, yesterday as he touched a picture of Ertell on the T-shirt of Andrew McLellan, Malanie's husband. They were at the state Capitol as Ertell's family and friends pushed for tougher laws against teens accused of murder or sexual assault. Friends and family of an Ewa Beach woman who was raped and murdered last year are calling for stricter measures against teenagers accused of similar crimes. State Rep. Kymberly Pine (R, Ewa Beach-Iroquois Point) will introduce a bill that would mandate youths aged 15 to 17 to be tried as adults if they are accused of first- or second-degree murder or first- or second-degree sexual assault. 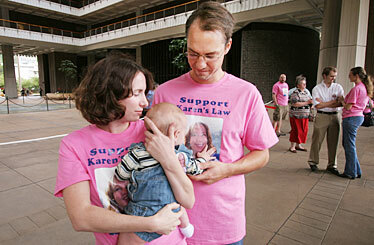 The bill, dubbed "Karen's Law," would likely not affect the current case involving the murder of 51-year-old Karen Ertell. In May last year, Ertell was found raped and strangled in her Ewa Beach home. Since then, family, friends, police and prosecutors have been pushing for the Family Court to waive its jurisdiction, so the accused, a 15-year-old boy, would be tried as an adult. He is charged with first-degree murder, first-degree sexual assault and theft-related charges. "We're realistic knowing that it's too late," Pine said. "We don't want any other family to go through this limbo of pain, of wondering whether they're at least going to get a trial as an adult or a minor. That's too much for a family, especially in a brutal murder like this where they personally found her." The closed-door jurisdiction hearing has been postponed a third time. It was to take place this month, but is now scheduled for April 8. Ertell's boyfriend, Kevin Callahan, said the defense's psychiatry report was not ready. He said not a day goes by that he and other loved ones don't think about what happened to Ertell. "This is a life sentence for us," he said. At a news conference yesterday, Pine said she expects the bill to meet strong opposition, despite some measure of bipartisan support from other legislators. If it fails, Sen. Will Espero, chairman of the Senate Public Safety Committee, will introduce two more bills. One would allow for Family Court hearings to be open to the public if the minor is not tried as an adult. "This type of case should be in the domain of the public," Espero said. The other bill would allow Family Court judges to sentence minors beyond their 19th birthday. Espero said a draft of his bill states the minors are to be released when they turn 26, but that he is open for it to be amended. "Changing the juvenile law is very hard in Hawaii," Pine said. "Passing the three-strikes law was hard enough. ... We may need those fallback bills. We're interested in passing something that moves us forward, even if it's just inch by inch." Pine also will introduce a bill that would allow for notification of school officials when a minor is accused of murder or sexual assault, and allowing those records to be made available to the school. Malanie McLellan, Ertell's foster daughter, shed tears when she talked about how excited Ertell was to be a grandmother. McLellan gave birth three weeks after the murder. "We just hope that if anyone else has to rely on the laws, it'll be a more streamlined approach," McLellan said, adding that although she respects the current process, she wants the laws updated. "In a way, this law is a way for her to keep on giving."